Make the trek to the Seattle Art Museum for a stunning 40-year look at one of the world's most prolific designers, with hundreds of sketches, mannequins, swatches, and more. 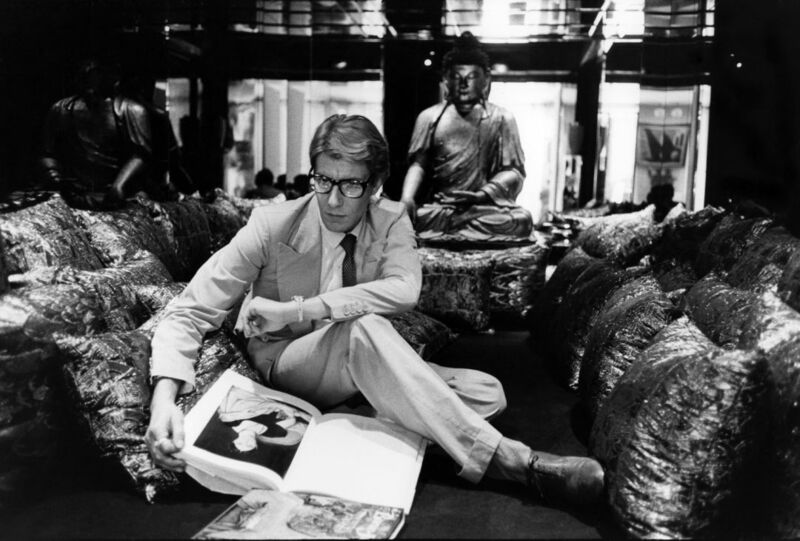 Yves Saint Laurent at home, 55 rue de Babylone, Paris, 1977, © André Perlstein. At age 17, in the mid-1950s, Yves Saint Laurent moved from his coastal town in Algeria to Paris to study at the Chambre Syndicale de la Haute Couture. It was a pivotal decision, planting the seed for the young man to become one of the most influential designers of all time. Christian Dior was at the height of his acclaim, and he hired Saint Laurent to work in his atelier. 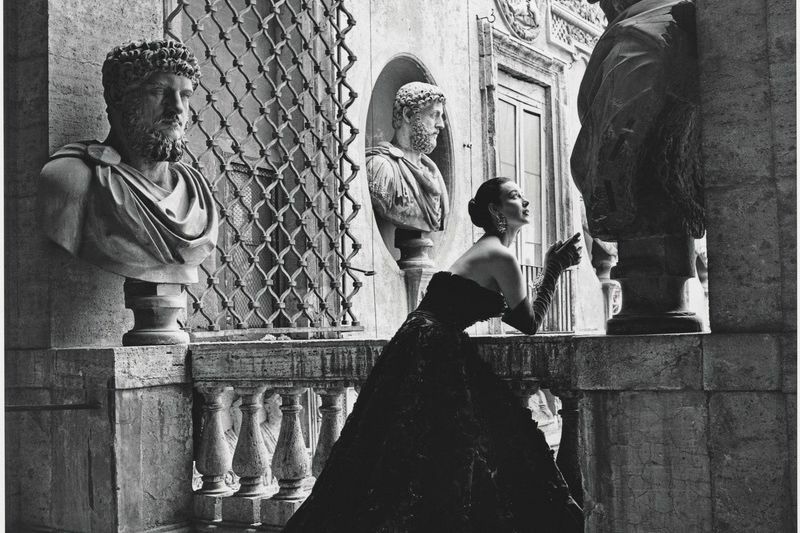 In 1957, Dior died suddenly of a heart attack, leaving the fashion world reeling—and a then 21-year-old YSL to become artistic director and keep the brand alive. Despite the enormity of the task, YSL's first collection for Dior, Trapeze, was a huge success, and the world glimpsed his charm and talent. He would continuously impress over his 40-year career, from his legendary 1965 Mondrian collection to launching a rive gauche–the first ready-to-wear collection from a couturier–to snazzy tailored tuxedo suits for men and women. 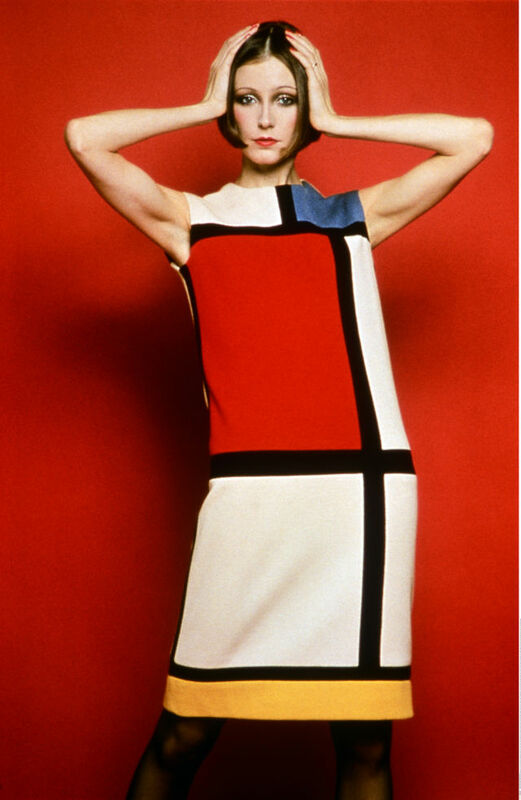 Cocktail dress worn by Susan Moncur, Homage to Piet Mondrian, Fall/Winter 1965 haute couture collection, © INTERFOTO / amw / François Lamy. 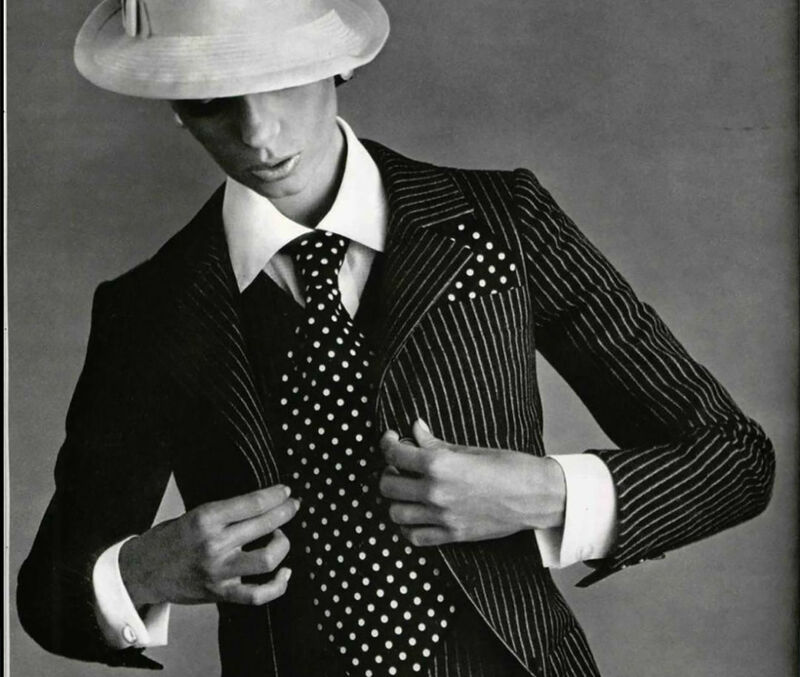 The prolific YSL–he accumulated decades of sketches, process sheets, shows, and collections–was also the first living fashion designer the Metropolitan Museum of Art honored with a solo display, in 1983-84. It was clear he made for a good museum exhibit. Ishikawa worked alongside guest curator Florence Müller and exhibition designer Nathalie Crinière to start crafting the curatorial ideas architecturally. 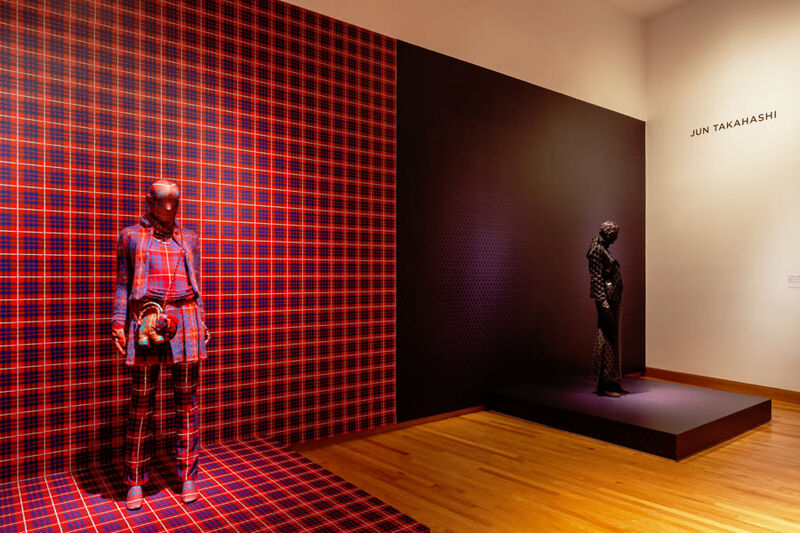 They also reached out to the Portland Art Museum, which had itself put together a successful Italian Fashion exhibit, to borrow ideas on how to include members of the local community. The resulting experience—Yves Saint Laurent: The Perfection of Style—is nothing short of stunning. The exhibit begins with Saint Laurent’s childhood sketches and draws you in through black-and-white photos, giving glimpses of insight into the sometimes-enigmatic designer. 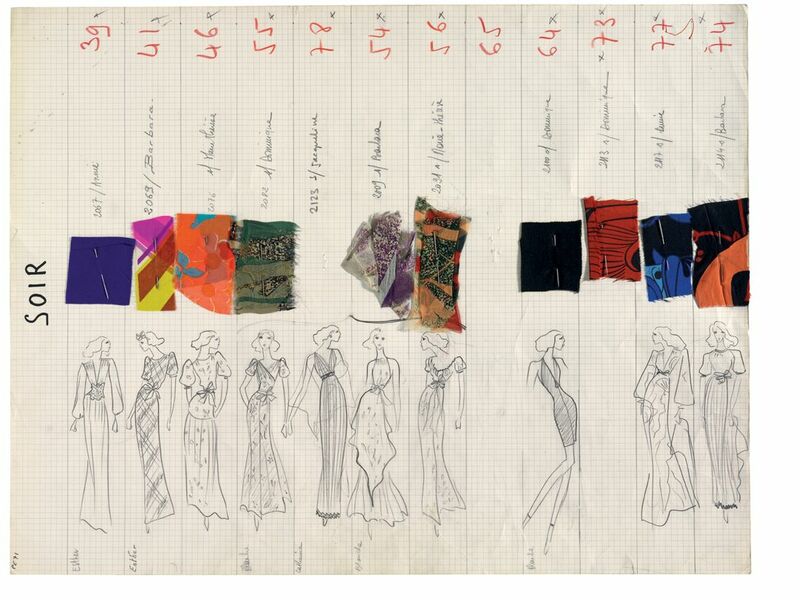 See hundreds of process sketches in his fluid, gestural lines, grouped by collection, with fabric swatches attached. An entire room pays homage to the textiles over which YSL labored: custom prints, embroideries, and embellishments of all kinds. Step into a small room, where focused can lights sparkle on a massive display containing just a fraction of his lifelong collection of costume jewelry. And then there are the clothes. Suits interspersed with video installations, the famous Mondrian dress pictured in every fashion textbook, red carpet looks, bridal attire, and more line the rooms, with color swatches creating rainbows between. "First" pantsuit, Spring/ Summer 1967 haute couture collection, © Patrick Bertrand/Les Editions Jalou. Beyond the artfully arranged couture, the museum has created a series of events, including drop-in drawing sessions with fashion illustration instructor Lori Meyer, members-only nights, and a YSL-inspired fashion show. After exiting the exhibit, stroll through the gift shop for various worthy presents, from a clothing rack filled with Seattle designers to a selection of pieces by Portland designer Adam Arnold (including a brilliant vermillion ruffle dress you can’t help but ogle). Make the trek to Seattle for this once-in-a-lifetime opportunity to see so many historic pieces. The exhibit runs through January 8, with public programming details here. And in Portland, you can visit Arnold, our own YSL-esque designer—a master of fit, lover of fun details, and equally charming and enigmatic—who is holding public hours at his studio for the first time, 4–7 p.m. on Thursdays and Fridays and noon–3 p.m. on Saturdays. SOIR collection board, Spring/Summer 1971 haute couture collection, © Fondation Pierre Bergé-Yves Saint Laurent, Paris. Mens Apparel, Womens Apparel 338 SE Martin Luther King Jr. Blvd.